2019 will be a year of slowing down and being more productive. I know that sounds counterintuitive, but my hope is that planning, prioritizing and scheduling will keep me motivated in creating artwork and spark some new ideas. I have been rushing my projects to meet deadlines and not enjoying the process. 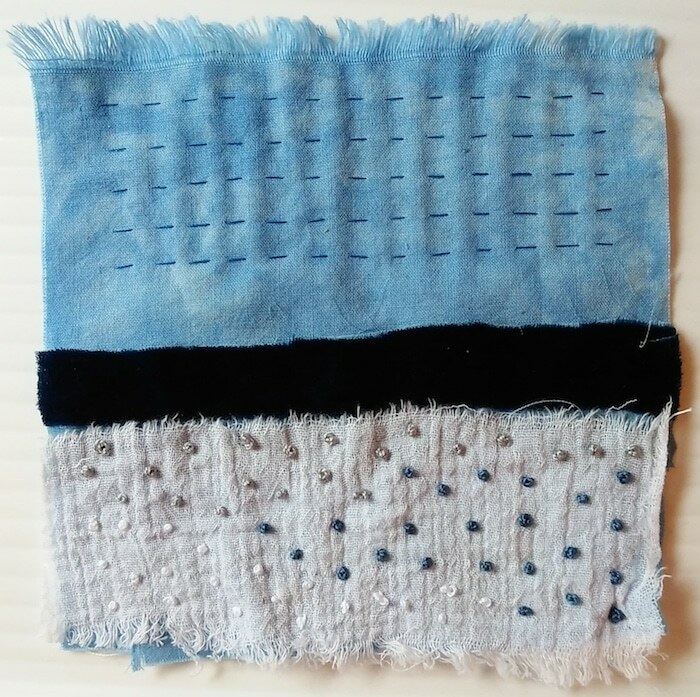 So, I decided to begin a 100 day Stitch Meditation Challenge for myself. Twice a week for the year 2019 I will sit quietly and hand stitch. In the past few years, I’ve seen creatives embark on their own year long projects and wishfully thought about joining in. Realistically, I didn’t and still don’t feel I have time to work on a creative project daily. I certainly daydreamed about how that would look for me. But, the reality of sitting down to incorporate a daily project into my routine only caused me to become anxious and stressed. As daily and 100 day projects popped up on social media recently, I decided to see how I could realistically commit to a year long art project. 100 days sounded more doable than daily. Then I calculated that 100 days in a year works out to twice a week. I certainly could fit two sessions of 20-40 minutes into a week! I researched what other creative people did for their daily projects and have listed a few resources below. 100 days of Stitch Meditation is tailored for my life and my schedule. I want this project to work for me. I invite you to create your own year long practice. It can be machine stitching, drawing, painting, singing, whatever makes you happy. I’ve set out an outline of my project and will experiment with what works and what doesn’t, changing and editing as the year progresses. Blog: Wellesley-Smith, Claire. 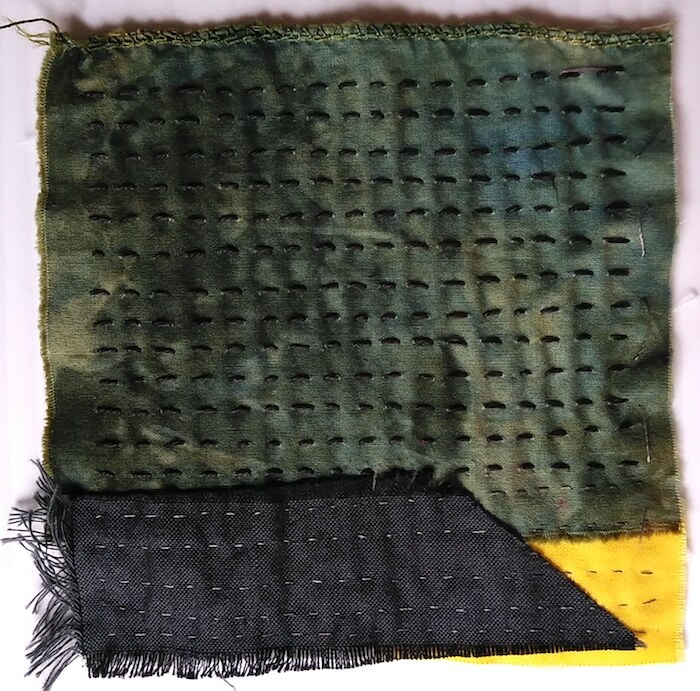 Slow Stitch: Mindful and Contemplative Textile Art. London: Batsford, c2015. This is only a brief list of resources available. 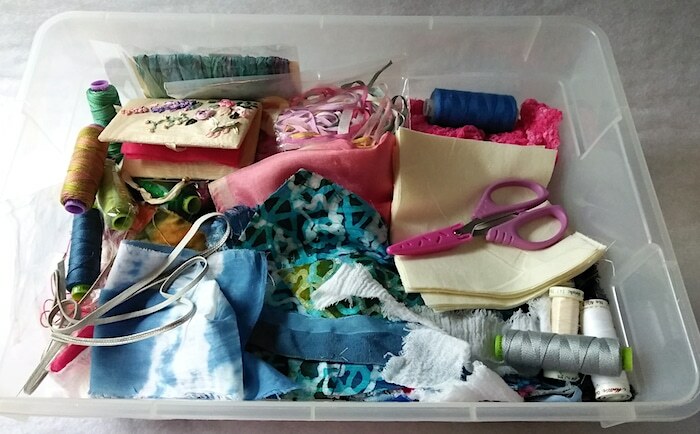 As my year long stitch meditation journey unfolds, I will be sharing photos and more resources. Are you planning on joining me? I would love to hear from you. Share your favourite photos, websites, and books with me. I hope you take time this year to really enjoy the process and to create what makes you happy and feeds your creativity. Let’s being the journey! Hi Doris, I just finished an online course with Sue Stone “Exploring textures and patterns with Sue Stone”. It really helped me expand on some of my favorite stitches. My plan for 2019 is to really apply what I learned to my art, and of course slow down, experiment more and be more mindful of the process of stitching. My other goal for the coming year is to focus on some techniques that I enjoy, instead of going off in all directions. I am really doing it for the process. 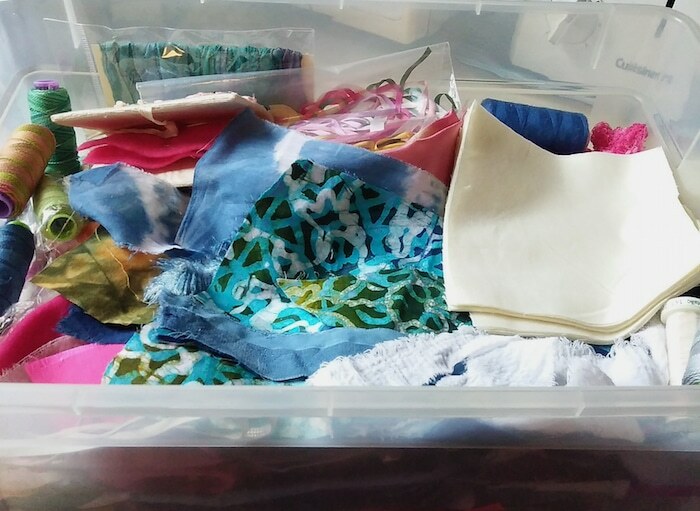 Sitting quietly with intention to create, using only materials from my preselected stash. I want to focus on what I am doing in the moment. Helen Garland in a previous comment suggested creating a notebook of stitches as Sue Stone has done. This notebook would then become your personal embroidery stitch reference. The parameters for your practice can be different from mine. Others have created 100 or daily pieces with the intention of displaying them in an art gallery and then selling them. Lisa Call did this in 2017 and her pieces were displayed in a gallery in New Zealand. She new she needed something to motivate her to create everyday. Carol Trice also started a 100 day challenge in June of 2018. Her work is mounted on canvas and available for sale. That could be something you might want to think about. Is there a gallery, a library, coffeehouse that might be interested and have the space to display the 100 items you create? There is another textile artist who embroiders one block every day and at the end of the year, joins them into one large piece. I can’t remember her name, but will find it and incorporate into a blog post. I will be blogging about my process and incorporate artwork and processes from the artists I’ve mentioned an others too. I don’t have a plan at this point to make the artwork with an end to displaying and/or selling. Right now it’s enough for me to just to make the work with intention and without stress and deadlines. I hope you will consider joining in. You can start without having a specific outcome and think about what you would like to happen. Everything can change, nothing is set in stone. Thank you for your comments, so happy to have sparked an interest. Let me know what you decide. 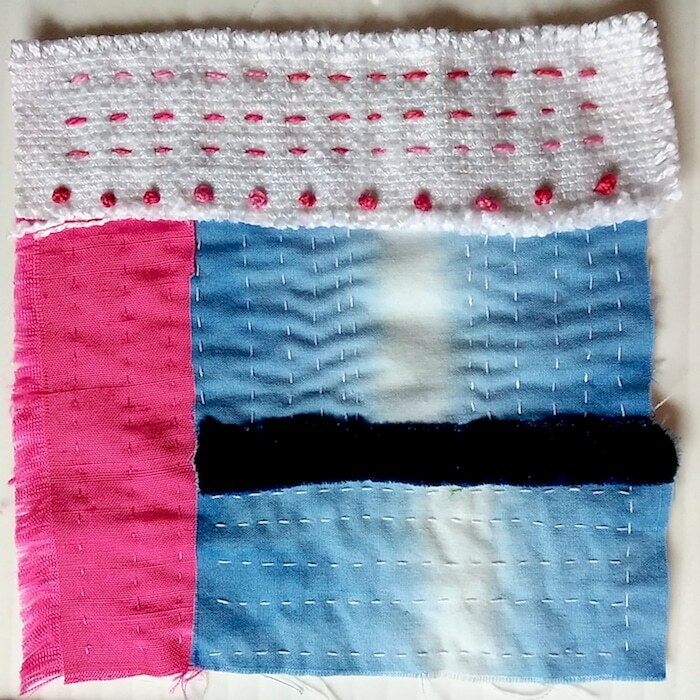 @obliquepoet is an artist who stitches /embroiders images daily in small squares. Beautiful work. I have watched her progress over this past year. I’m in for this! Here is to a happy and calm 2019! Thank you for recommending @obliquepoet. Lynn Harrigans work is beautiful. Happy to have you join in. Will be adding to the information and including other artists too. Yes, a calmer and more productive 2019! I am familiar with Sue Stone’s work. Creating a book of stitches is certainly an option. A great reference for the future as you say. 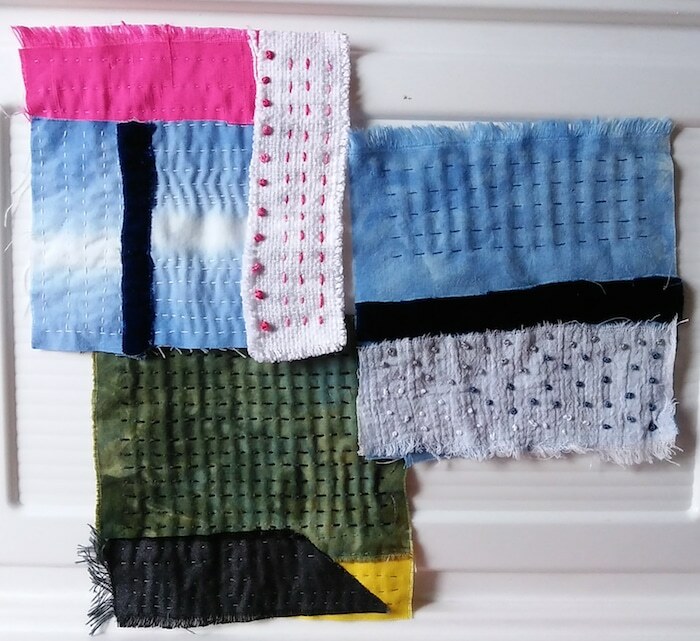 I will be talking about Sue’s work and some other textile artists too in future blog posts. So many creative artists to explore! Thank you, exciting to start something new. I will be experimenting with a variety of stitches, but French Knots are one of my favourites.